Nuby 2-Stage Grow Nurser Feeding Bottle - 320 ml | Blue | Anti-colic bottles to prevent baby from gas and colic. 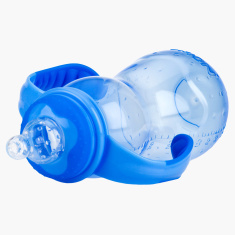 Featuring handles on either side, this feeding bottle is easy for you to hold while nursing your baby. The anti-colic teat prevents your baby from gas and the soft material is gentle on your child's oral cavity.